Philadelphia is part of the VA “25 Cities Initiative” which aims to build on President Obama’s 2009 announcement to end Veteran Homelessness by 2015. As cities with high veteran populations successfully stamp out veteran homelessness, as the City of New Orleans announced last week, the once wildly ambitious goal appears all the more attainable for Philadelphia. Martha Kegel, Director of UNITY, the organization that led the final push in providing housing for homeless veterans in New Orleans, shed light on how this can be achieved in priority cities, “Of course you understand that going forward, it’s not like no one is ever going to become homeless again, but it’s about having a rapid response system in place so that the number of veterans who are in homelessness at any given point is never more than what you can house that month.” The VMC and other organizations spearheading the initiative locally, are following a similar model and after tremendous progress, expects to end veteran homelessness in Philadelphia by the end of this year. About Impact Services – For 39 years, Impact Services, a non-profit in the Kensington area of Philadelphia, has worked to address the root causes of poverty and alleviate neighborhood distress. Impact’s Veteran Services department serves over 300 veterans a year offering homeless and disadvantaged veterans comprehensive sets of housing, employment, and supportive services. About the City’s Office of Supportive Housing –The mission of the Office of Supportive Housing is to assist individuals and families in moving towards independent living and self-sufficiency in safe and stable housing through Philadelphia’s homeless Continuum of Care. 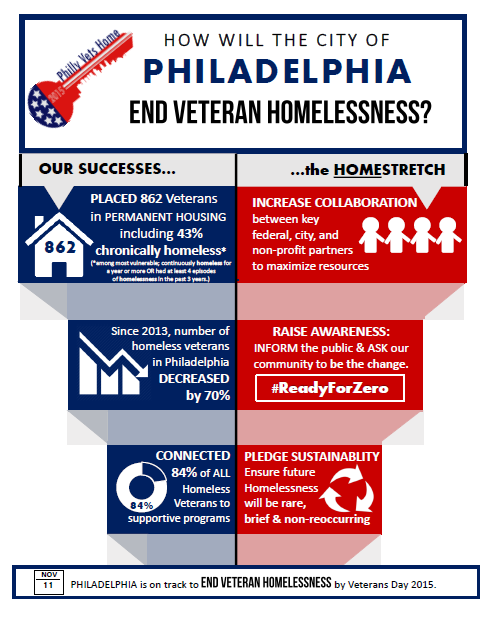 Philly Vets Home 2015 set a 100 Day Goal to house 134 veterans, 34 of the veterans would be chronically homeless, and to assess 30 of the veterans using the VI-SPDAT tool by February 28, 2015. Well . . . we are excited to announce that we have surpassed our goal by housing 142 veterans in 100 days— 61 were chronically homeless, and 30 veterans were assessed in VI-SPDAT.